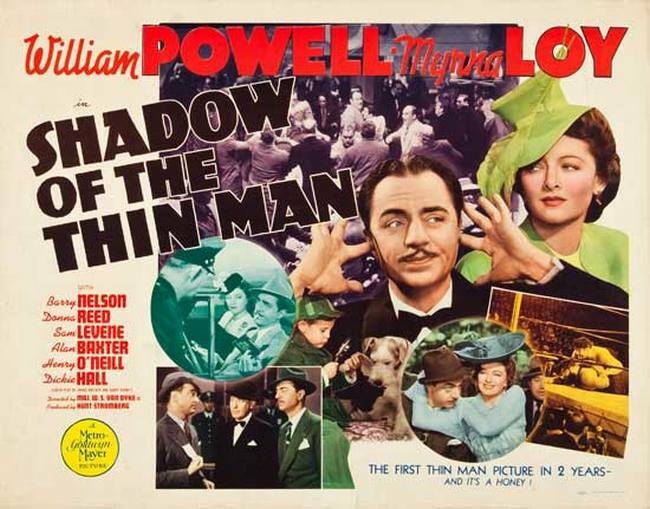 Welcome to Film Noir Friday — Sunday Matinee! The lobby of the Deranged L.A. Crimes theater is open! Grab a bucket of popcorn, some Milk Duds and a Coke and find a seat. 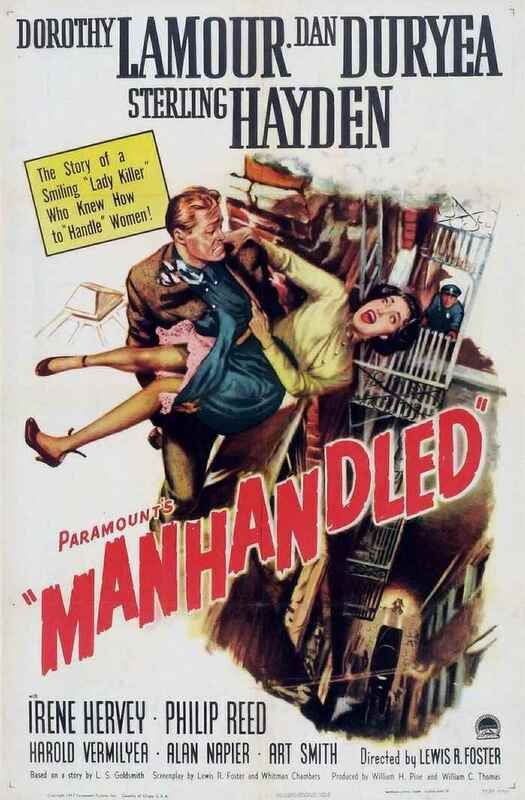 Tonight’s feature is MANHANDLED starring Dorothy Lamour, Dan Duryea and Sterling Hayden. Enjoy the movie! Unemployed writer Alton Bennet tells psychiatrist Dr. Redman about his nightmares, in which he dreams that he murders his wealthy wife Ruth with a heavy perfume bottle. Redman’s secretary, Merl Kramer, takes notes as Bennet denies coveting his wife’s jewels, which are worth $100,000. After Bennet is refused an advance from his publishers, he becomes jealous of Ruth’s close relationship with handsome young architect Guy Bayard, who is designing their new beach house. Welcome! The lobby of the Deranged L.A. Crimes theater is open! Grab a bucket of popcorn, some Milk Duds and a Coke and find a seat. 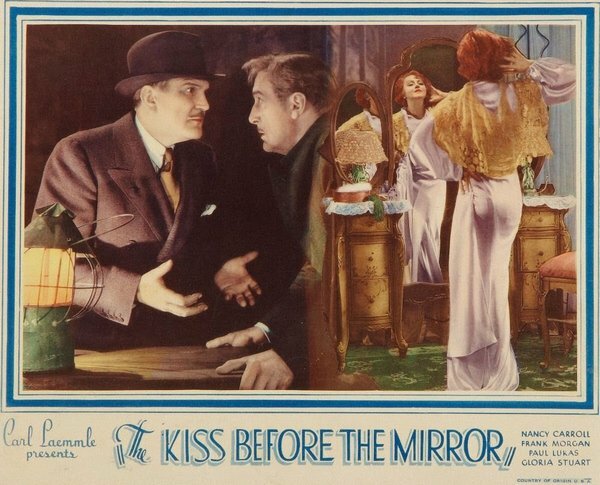 Tonight’s feature is SLIGHTLY HONORABLE starring Pat O’Brien, Edward Arnold, Broderick Crawford and Ruth Terry. This film was directed by Tay Garnet who, seven years later, would direct THE POSTMAN ALWAYS RINGS TWICE. Enjoy the movie! Attorney John Webb is fighting the corruption of a political ring led by Vincent Cushing, a newspaper publisher who has become very wealthy through graft. Webb’s only ally is his law partner, Russ Sampson. While at the state capitol to enlist the aid of Senator Scott, the two meet Alma Brehmer, Cushing’s mistress and a law client of Webb’s. Alma invites them to a party that Cushing is giving at Pete Godeana’s nightclub that night, and Webb accepts. At the club, Webb is impressed by dancer Ann Seymour’s performance in the floor show until he learns that she is only eighteen. Minutes later, he hears Ann scream and sees Godeana slapping the girl. Webb punches Godeana and takes Ann from the club. Welcome! The lobby of the Deranged L.A. Crimes theater is open. Grab a bucket of popcorn, some Milk Duds and a Coke and find a seat. 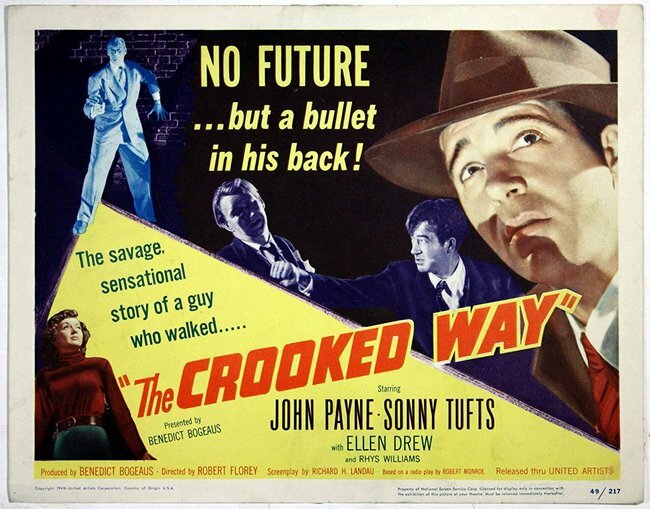 Because it is Memorial Day, today’s film, THE CROOKED WAY, features a tale about a WWII war hero suffering from amnesia. 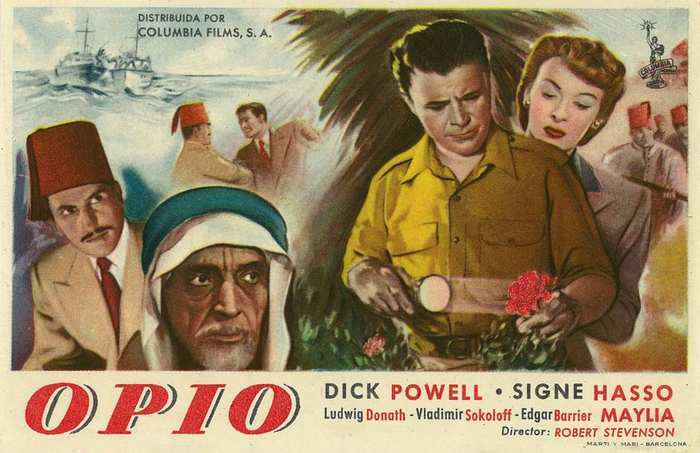 The film stars John Payne, Sonny Tufts and Ellen Drew. Eddie Rice, a veteran suffering from amnesia, returns to Los Angeles from a San Francisco veterans hospital hoping to learn who he is and discovers that he is a gangster named Eddie Riccardi and has a police record. Although he does not know it, five years earlier, Eddie was acquitted of murder after turning state’s evidence for homicide detective Lieutenant Joe Williams. His partner, Vince Alexander, took the “rap” and spent two years in prison. On a Los Angeles street, a woman recognizes Eddie and reports him to Vince, who sends his thugs to beat up Eddie. Welcome! The lobby of the Deranged L.A. Crimes theater is open. Grab a bucket of popcorn, some Milk Duds and a Coke and find a seat. 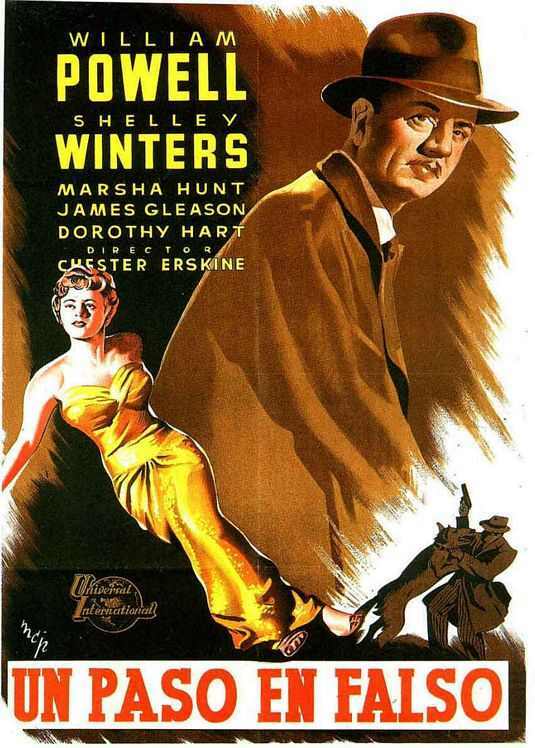 Tonight’s feature is TAKE ONE FALSE STEP starring William Powell, Shelley Winters, Marsha Hunt and James Gleason. Prof. Andrew Gentling, in Los Angeles to help found a new college, is inveigled by old flame Catherine Sykes into a midnight drive. 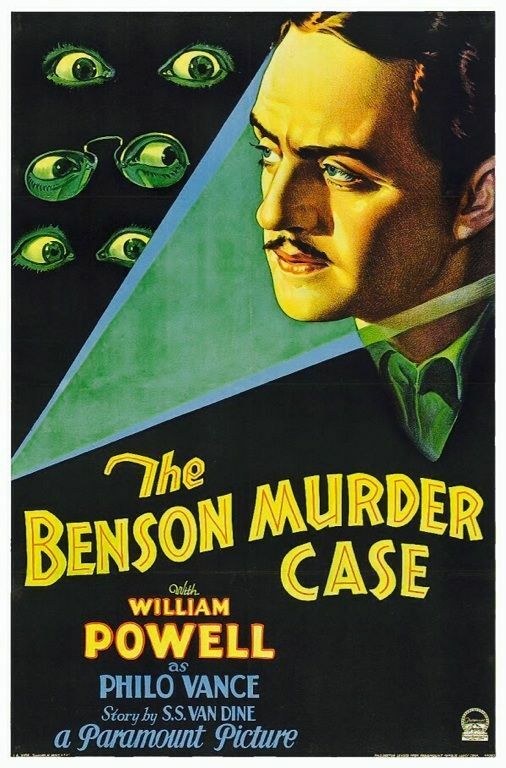 Next day Catherine is missing, believed killed; friend Martha convinces Andrew that he’s a prime suspect and should investigate before he’s arrested. But this only puts Andrew in a more deadly kind of danger. Welcome! The lobby of the Deranged L.A. Crimes theater is open. Grab a bucket of popcorn, some Milk Duds and a Coke and find a seat. 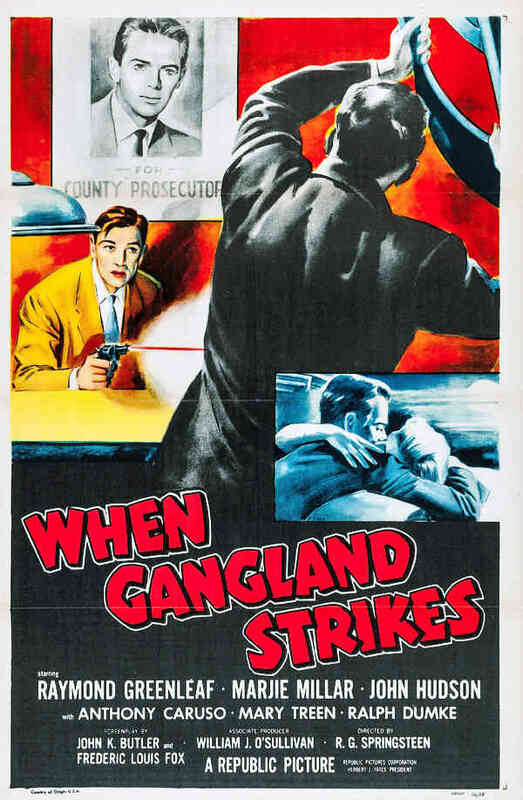 Tonight’s feature is WHEN GANGLAND STRIKES starring Raymond Greenleaf, Marjie Millar and John Hudson. Gangster Duke Martella, accompanied by his lawyer, Leo Fansler, goes to pick up his girl friend, Hazel Worley, upon her release after serving a one-year prison sentence. Martella is accused of killing a key witness in the district attorney’s murder case against him and worries about his upcoming trial. On the ride to town, Hazel explains that she promised her recently deceased cellmate that she would deliver a letter to a man named Luke Ellis, who lives in the sleepy town of Lawndale. In Lawndale, meanwhile, Luke, the county prosecutor who believes “in squeezing human understanding into the law,” reluctantly cross-examines Jerry Ames, a young Korean War veteran who has been accused of stealing $27.50 from his employer, Walter Pritchard, the owner of the local hardware store. When Luke argues that Jerry only borrowed the money to buy his wife an anniversary present, the jury finds him innocent and the courtroom erupts in applause, much to the chagrin of Pritchard, who believes that Luke is far too lenient to be a prosecutor. Welcome! The lobby of the Deranged L.A. Crimes theater is open. Grab a bucket of popcorn, some Milk Duds and a Coke and find a seat. 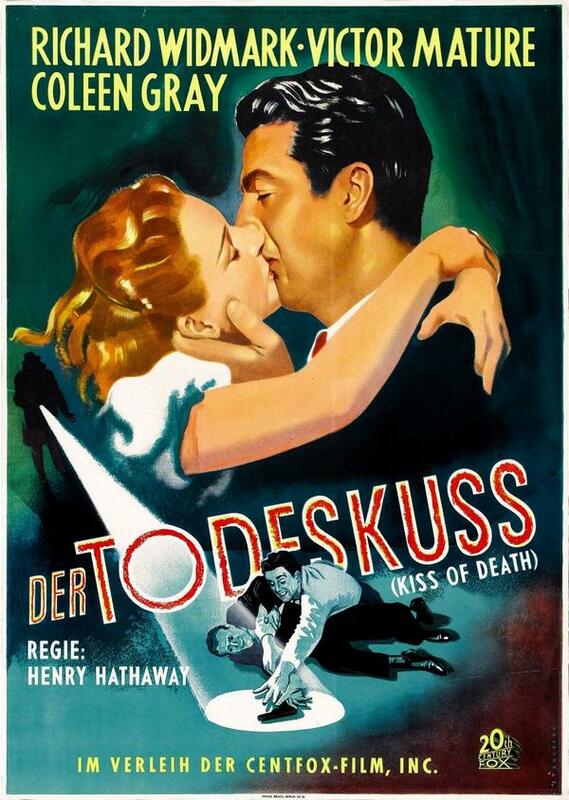 Today’s feature is KISS OF DEATH starring Richard Widmark, Victor Mature and Coleen Gray. This is one of my favorites. On Christmas Eve, down-on-his-luck Nick Bianco, an ex-convict, and his three cohorts rob a jewelry store located on the top floor of a New York skyscraper. Before they can exit the building, however, the proprietor sets off his alarm, and Nick is apprehended by the police. Later, Assistant District Attorney Louis D’Angelo tries to persuade Nick, who has two young daughters and a wife, to name his accomplices in exchange for a light sentence. Sure that his lawyer, Earl Howser, and cohorts will look after his family while he is incarcerated, Nick refuses and is given a twenty-year sentence.